Udvandring: Europa, specielt Italien, Nordamerika, Sydamerika. Minoritetsgrupper og oprindelige folk / indigenous peoples: Pygmæer. The Demographic Profile of African Countries. / : The Economic Commission for Africa. Addis Ababa, 2016. The world’s population has increased by 2.9 billion over the past 35 years, from 4.4 billion in 1980 to 7.3 billion in 2015. Although population growth rates have slowed, the world’s population is still growing by 81 million people each year, and Africa is contributing significantly to that growth. 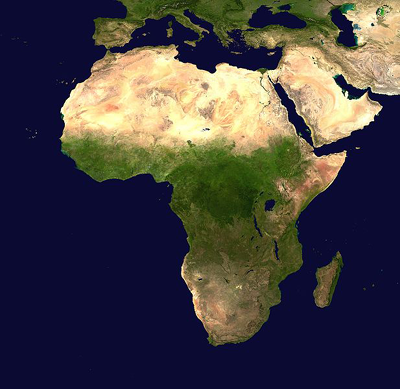 The size of Africa’s population was estimated at 478 million in 1980. The continent’s population has nearly trebled and is currently estimated at close to 1.2 billion persons. During the same period, Africa’s share of the world population increased from 10.8 per cent in 1980 to the current estimate of 15.9 per cent in 2015, and is projected to reach nearly 30 per cent (2.92 billion) in 2063. Guide to the sources of the History of Africa and of the Indian Diaspora in the Basin of the Indian Ocean in the National Archives of India.. / : S.A.I. Tirmizi. International Council on Archives, International Writers Emporium, UNESCO 1988. Indigenous Peoples in Africa: the forgotten peoples? The African Commission's work on indigenous peoples in Africa. / : African Commission on Human and Peoples' Rights (ACHPR), International Work Group for Indigenous Affairs, 2006. Leder: Afrika: Ét problem, én løsming. I: Information, 24. juli 2007.